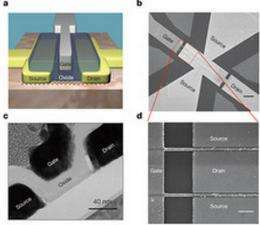 (PhysOrg.com) -- In a report published in Nature, Yu-ming Lin and Phaedon Avoris, IBM researchers, have announced the development of a new graphene transistor which is smaller and faster than the one they introduced in February of 2010. This new transistor has a cut-off frequency of 155 GHz, compared to the 100 GHz previous transistor. Graphene is a flat sheet of carbon which is one atom thick and has the ability to conduct electrons at extremely fast speeds. It is quickly on its way to replace the traditional silicon as the top electronic material for faster transistors. Graphene devices have been made previously by placing the graphene sheet on top of an insulating substrate, such as silicon dioxide. However, this substrate can degrade the electronic properties of the graphene. However, the team of researchers has found a solution to minimize that. A diamond-like carbon is placed as the top layer of the substrate on a silicon wafer. The carbon is non-polar dielectric and does not trap or scatter charges as much as the silicon dioxide alone. This new graphene transistor, due to the diamond-like carbon, shows excellent stability in temperature changes, including extremely cold temperatures like that in space. These new high-frequency transistors are being targeted to applications primarily in communications such as mobile phones, internet, and radar. The manufacturing of these new graphene transistors can be accomplished utilizing technologies already in place for standard silicon devices, which means commercial production of these transistors could begin at any time. The transistor development was part of an ongoing research project IBM is doing for the U.S. Department of Defenses DARPA (Defense Advanced Research Projects Agency) program. The military is looking to this research to help in the development of high-performance radio frequency transistors. Nice, the next generation of performance is almost here. Waiting for a countermove from Microsoft. It is nice to see a real application for graphene so quickly. One question, and this is just my own ignorance because I don't know a ton about the subject, but is graphene waste an environmental concern? I don't think anyone knows enough about graphene to say just yet. Is there a performance increase over currently used chips? The article did not mention it. Even if the transistor is larger than traditional transistors, its transision speed is enormous, uses less energy and creates less heat. The number of transistors needed to be of comparable speed of nowadays chips is much less. I think you mean nanotubes? They are feared to have the same effect as asbestos... but its not certain yet. Don't you mean Global Foundries and other CPU/GPU bakers? Microsoft does not bother with transistors, neither does intel or amd or nvidia etc, they design architectures and layout. -- and the usual nonsense crap spouted by QC, take ur meds man. Let's say each transistor is 155ghz, as the article says. Now let's say you have a processor which needs to process instructions and data, and we'll call it a 64-bit processor. Now not every instruction is the same. Some instructions are straightforward and don't even require individual calculations, while other instructions require things like adding, subtracting, and multiplication, etc. Anyway, it depends on the operation. What no one seems to realize with regards to higher frequency chips is that you'll never get the information, which is to be processed, to the chip fast enough to even come close to making use of each clock cycle. So for example, you could expect a processor or network card or other device using graphene transistors to PROBABLY have a net clock speed of around 15ghz, maybe a bit more than that. From the diagram, it looks like the transistor there is probably a 40nm gate, which is not that much bigger than existing 32nm gate transistors. Not true. There are several techniques for doing it, including racetrack memory for faster reads from the secondary storage. Then there is optical buses, which will avoid the heat waste and resistance of electrical buses, and should even end up with less signal delay, AND avoid the problem of cross-talk between nano-wires. The reason L1 through L3 cache were invented is to move the most heavily used code fragments into memory on the same chip as the actual processor and registers. This allows for much smaller signal delays. Ok, and the other thing you fail to realize is they'll eventually have graphene or nanowire RAM which pushes spin charges along circuitry, instead of electrical impulses, which is faster and uses less energy. So we will eventually see spintronic and optical devices on the motherboard which will solve the signal delay problems and the bus speed problems. Let's say you are right, and the processors are so much faster than everything, well, you could design the chipset and entire motherboard to compensate by having multiple redundant input buses to run multiple threads simultaneously from different memory and cache. So each core might run 4 pipelines, therefore 4 to 8 threads at 15 gigahertz...no down time at all. Thanks, Quantum_Conundrum I retract my statement. LMAO*2- occurs NATURALLY in pencils? Anyway- how ironic that the substance in the lowest tech item is now the highest tech. I understand that you can get graphene from a pencil, we were laughing at the notion that pencils occurred naturally. So which operation will you be getting? Addition can be done with carry lookahead logic, meaning it can be fast. Multiplication, same, just use more transistors and structure it to be as fast as you want it to be. Pipelining is another tool to improve the throughput with some latency cost. I hope you don't work for a chip design company. Unless they need janitors. I heard that pencils grow wild in Pennsylvania. Good science should always be reported in good grammar. In the fourth paragraph, the last sentence that ends "... including extremely cold temperatures like that in space" should be "like THOSE in space" since the relative pronoun's referent cold temperatures is plural. An article not checked for grammatical errors may often lead the reader to wonder how well its facts might have been checked also.